I could have waited for the hand of autumn to paint the land with glorious color. I could have cleared a day on my calendar. But then, in all likelihood, something urgent would have come up to preempt my trip. Besides, I’ve already waited far to long to visit Aldo Leopold’s farm. I picked up my first copy of Leopold’s classic “A Sand County Almanac” sometime in my idealistic youth, when Wisconsin was just one of many unexplored states west of my home in New York. That slender volume with its cover illustration of wild geese calling, now yellowing and worn with age, has survived many a move. The most important brought me permanently to Wisconsin. Coincidence. 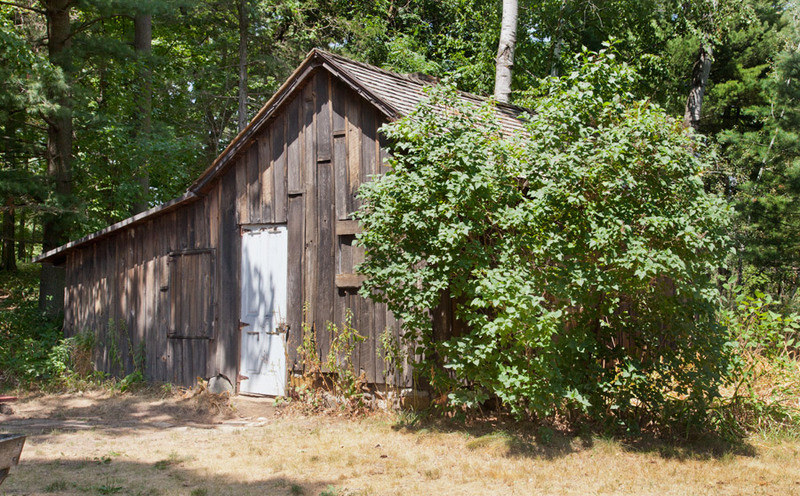 Since then, over more decades than I care to enumerate, I often thought about visiting “the shack” where Leopold lived, wrote, and experimented with the ecological ideas that made him justifiably famous. Though fame and influence have a way of crossing over into mythos, Leopold’s writing, both eloquent and accessible, rooted him firmly in the real world. I’ve never tired of rereading the “Almanac” but my latent aspiration went unconsummated. The trip wasn’t planned; you won’t find it on my calendar. On impulse, “with such dignity as I can muster of a July morning,” as Leopold wrote in his almanac entry for this month of deepest summer, I set out from the city to satisfy finally my long-dormant desire. 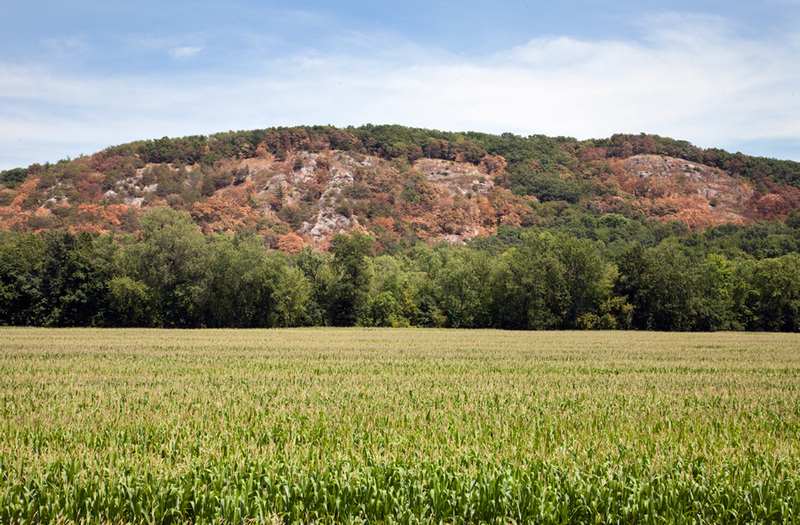 Two hours later I leave the freeway and head west through cornfields on a rural road that skirts the Baraboo hills, which are distressingly brown due to drought. A turn north takes me towards the Wisconsin River. The roads get progressively narrower and trees close in overhead. 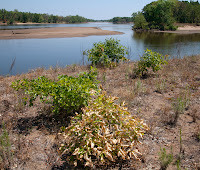 When Leopold bought his 80 acres along the Wisconsin River in 1935, it was little more than sand, having been cleared, over-farmed, and abandoned. I salute the dense forest that greets me on the final leg of my pilgrimage, knowing it to be the result of careful restoration efforts by Leopold and his family in the 1930’s and 40’s. The Leopold Center parking lot is full and its courtyard rings with a lively clamor. But down the road a piece there is only one car pulled off to the side where a humble log fence barely keeps the forest at bay. Fittingly, no signs mark the place. Leopold savored his solitude. The conundrum for this particular kind of historical site is how best to honor the founder’s intentions while welcoming a multitude of tourists eager to share in the experience. A passage from the Almanac is especially poignant: “There are degrees and kinds of solitude,” he wrote, as he described with relish being stranded by spring floods. 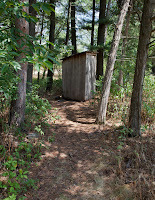 I set off through the thick stand of aromatic pines. An unlocked bicycle is propped against a trunk. A low post bears an elegantly designed numeral for the self-guided brochure I picked up at the Center. I read that 3,000 pines were planted every year despite the “dust-bowl conditions” that decimated the plantings with “95-99% mortality.” I ponder perseverance as the forest broods in deep shade under the midday sun. “The Prairie” opens suddenly before me. 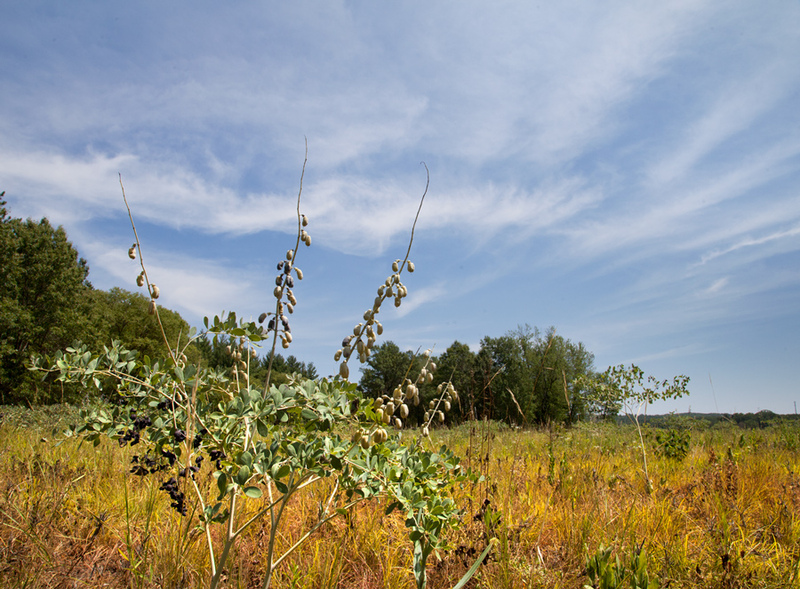 Bursts of white wild indigo with vibrant gray-green leaves stand out against prematurely yellowing sedges and prairie grass. Tall rhizomes reach skyward; the white flowers that give this species its name already have become strings of seedpods, many well on their way to mature black. Leopold was forward thinking in so many ways. This patch of sun and deep-rooted flora was a pioneer restoration project at a time when prairie landscapes were still underappreciated. Then, surprisingly close to the road, I recognize the asymmetrical roofline snuggled up against the woodland and the weathered gray wood siding and white door of “the shack.” It is not the farm’s most important feature, certainly not in the ecological sense. But the weight of his presence makes it Leopold’s most distinctive “signature on the face of the land.” The shack is modest and utilitarian. What, I wonder, would Leopold make of the sturdy padlock required to prevent admirers from walking off with his teakettle for a keepsake? Or one of the turtle shells he placed on a shelf along with his axes, shovel and saws? 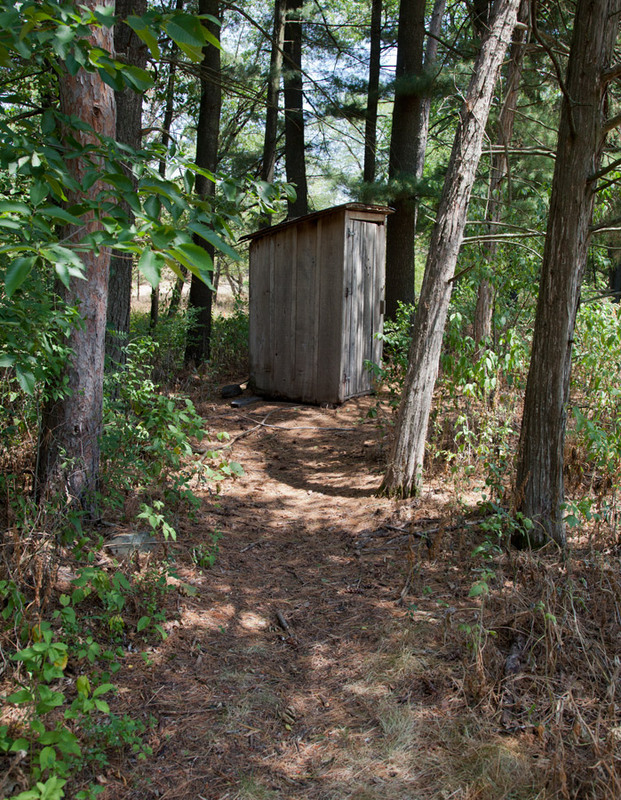 A few paces away, notched in a pine and cedar grove, is the outhouse. This decidedly more modest and utilitarian edifice, built by Leopold’s son, was engagingly dubbed “the Parthenon.” We value most the things that we make with our own hands. Compelling as they are as part of a portrait of the man, these material artifacts are not what I have come to see. Leopold himself concludes the foreword to his Almanac with the words, “Nothing could be more salutary … than a little healthy contempt for a plethora of material blessings.” No, I have come to walk the land that he so cherished, to listen for the birdcalls that he so lovingly describes, to steep myself in this very personal and yet universal biotic community. I find the sand farther on, near the river. It’s a wonder anything can grow here! But the evidence of nature’s resilience is incontrovertible. 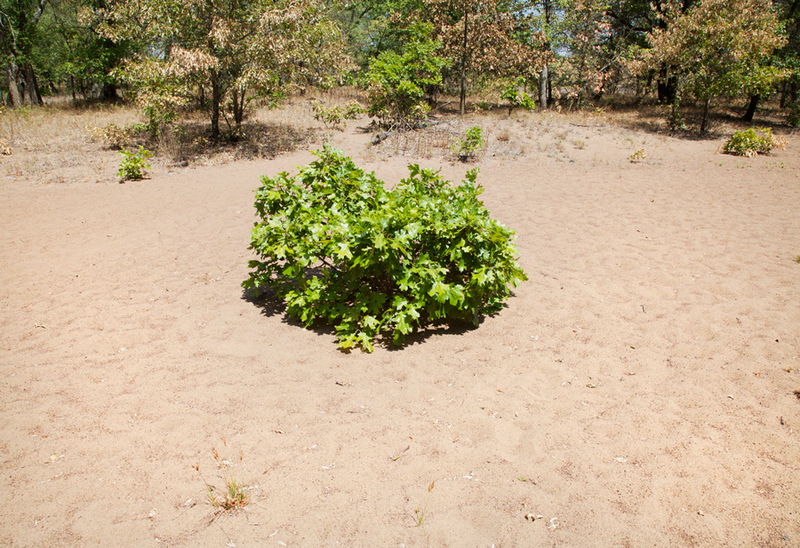 Oak saplings spring from the sand like biological explosions. Sauk is the actual name of this county. 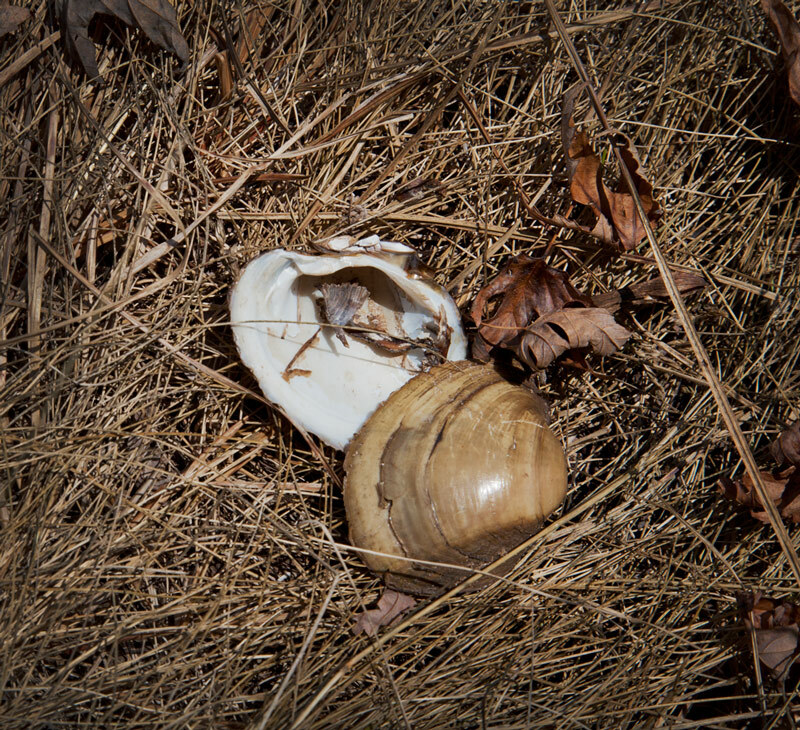 Leopold titled his almanac to express the ubiquity of sand and the hardships involved in farming on – or restoring it. In fact much of the underbelly of the entire state of Wisconsin is sand. Ironically, we are blessed with such nice sand – a very pure form of silica dioxide bearing a high compressive strength – that it is in great demand as a hydrofracking proppant. The sand is mixed with water and chemicals and then the resultant toxic slurry is injected at high pressures into fissures deep below the earth’s surface. The purpose of this violent and controversial process is to shake up shale and other rock sufficiently to release oil and natural gas. Thus we feed our fossil fuel addiction. I kick up a spray of sand, musing on one of Leopold’s most important and oft-quoted passages: “We abuse land because we see it as a commodity belonging to us. When we see land as a community to which we belong, we may begin to use it with love and respect.” How would the author of “A Sand County Almanac” feel, I wonder, if he knew that the sand, bane of agriculture and forest restoration alike, was being extracted “in excess of 12 million tons per year?”1 Large swaths of Wisconsin countryside, both farms and forests, are being ignominiously scraped away and transported to distant states with lucrative oil shale formations. The river is uncommonly low. It too seems to consist more of sand than water. Except for some dead logs, the surface remains unbroken under the hot July sun. No insects stir the air; no fish rise to seek them. A pair of gulls squabbles half-heartedly on the far shore. 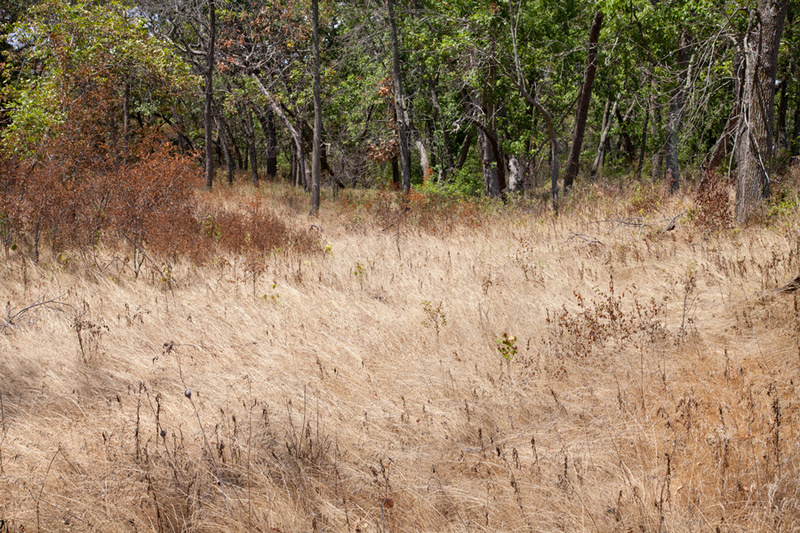 Scorched grasses and shriveled wildflowers line the riverbanks. The drought I’d observed earlier plagues huge swaths of the state. Is the drought an anomaly or a symptom of global warming? The governor – who disputes the possibility of global warming on ideological rather than scientific grounds – recently declared 23 counties disaster areas. 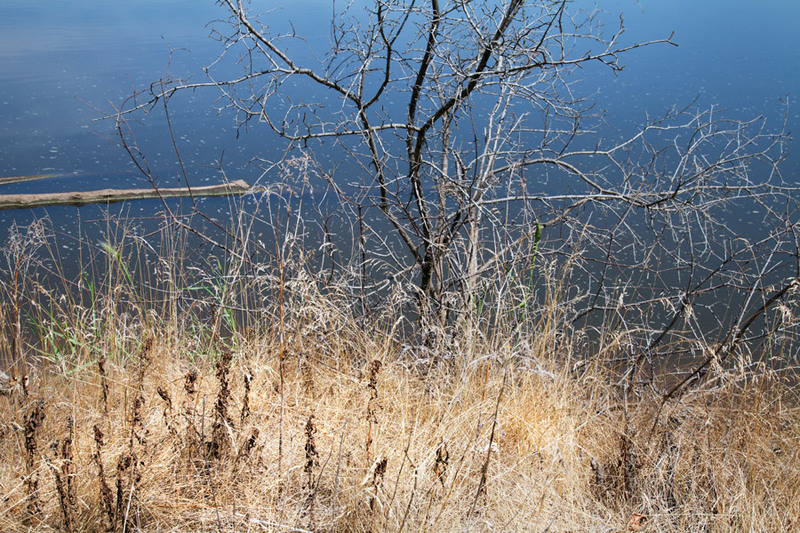 It is, indisputably, the worst drought in 24 years and counting, with no relief in sight. 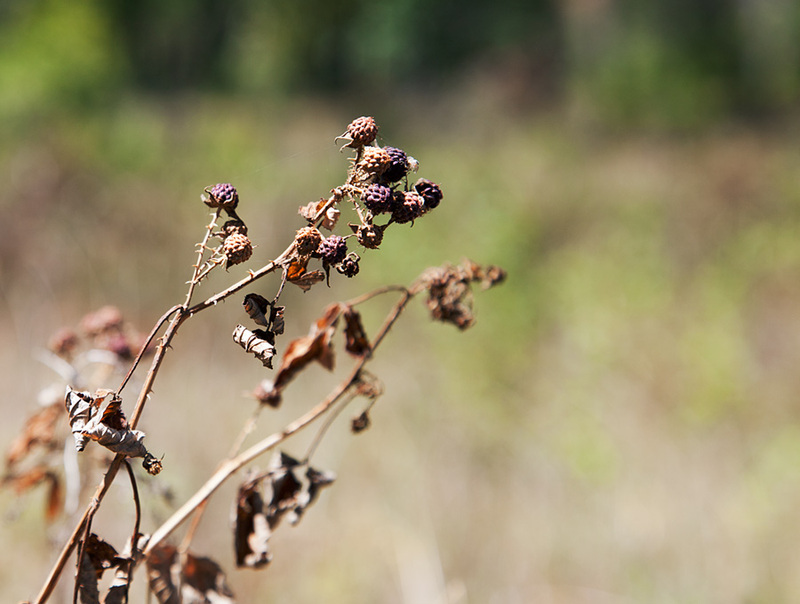 As I stroll through brown, desiccated grass I come upon a brake of scrawny and twisted berry canes, blackened as if by fire. A hard, tiny nub of a berry adorns the tip of each cane, so completely shrunken and disfigured that I can’t tell if they are wild raspberries, blackberries, or some other kind. 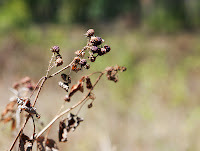 Drained of all succulence, neither bird nor passing pilgrim will dine on these drought-charred berries. Even in the shade of a boggy dell where ground cover remains green, I find deer tracks like future fossils embedded deeply in mud so dry that the weight of my step doesn’t squeeze out even a teardrop of moisture. The self-guided trail is a short loop that could be circumnavigated in less than half an hour, even stopping to read the brochure at every marker. My pace is leisurely. Each new unfolding moment I hold like a Rosary bead, feeling blessed. In the midday heat there are few signs of wildlife. I disturb a sunbathing turtle, which abandons its post on the end of a log with a peremptory plop. A disheveled knot of unidentifiable downy white feathers in the grass hints at the daily struggle of life in the wild. 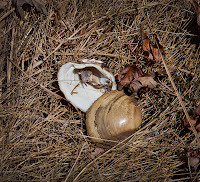 Farther on two empty halves of a shell leave no doubt that someone made a lunch of river clam. 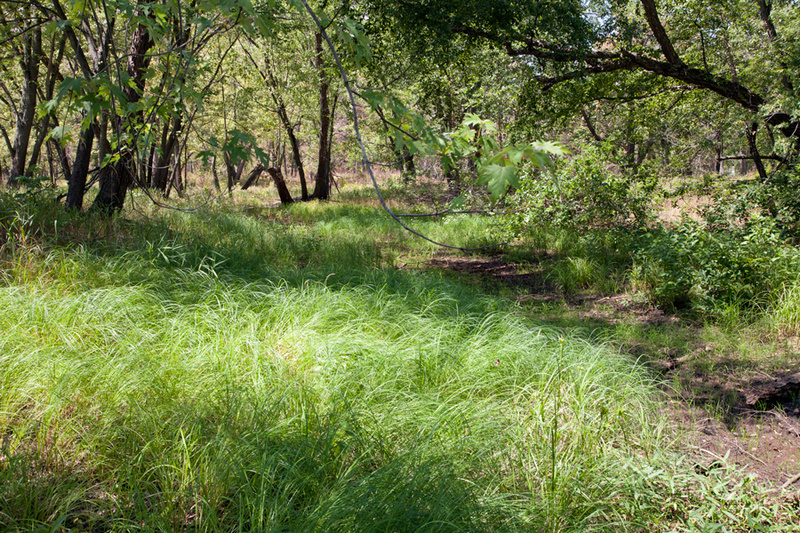 In his July chapter Leopold informs us, “During every week from April to September there are, on the average, ten wild plants coming into first bloom.” But on this late July day the woods seem bereft of flowers. Perhaps it’s the drought, or just the low point of deepest summer when the law of averages balances out profligate spring. “In June as many as a dozen species may burst their buds on a single day.” Not now. I am not complaining. There is no wrong time to for a walk outdoors. Leopold tells us “It is, by common consent, a good thing for people to get back to nature.” But what kind of nature do we find when we “get back to” it? 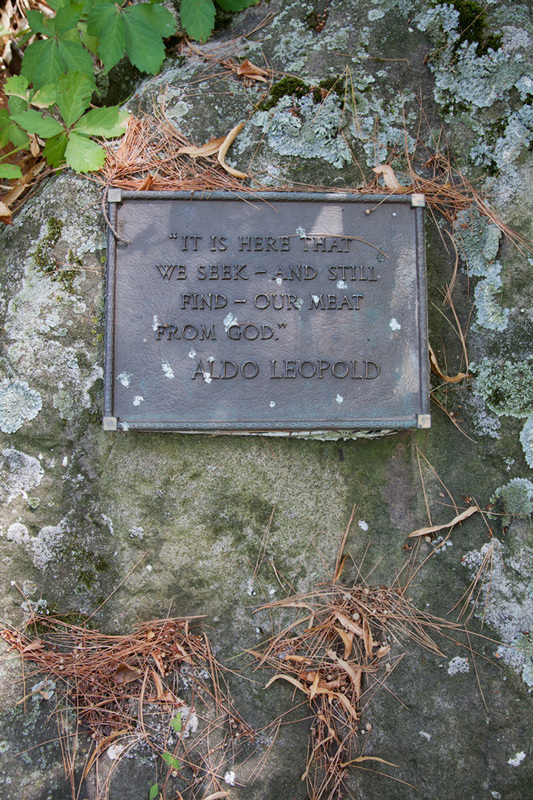 Leopold’s farm, in many ways, was and still is a laboratory for nature, for ecological restoration. Everywhere I walk I notice small, unnaturally bright orange flags festooning the groundcover, seemingly at random. I knew better than to expect a wilderness. Leopold himself identifies an inherent conflict: “All conservation of wildness is self-defeating, for to cherish we must see and fondle, and when enough have seen and fondled, there is no wilderness left to cherish.” The flags, I learn, mark patches of invasive garlic mustard so that the foundation staff can locate new sprouts early in spring before they have a chance to propagate. In lieu of wilderness we have, wisely it seems to me, opted for nature that is “husbanded” – managed for healthy and sustainable biodiversity. I don’t know when I first began to hear the sound of traffic. 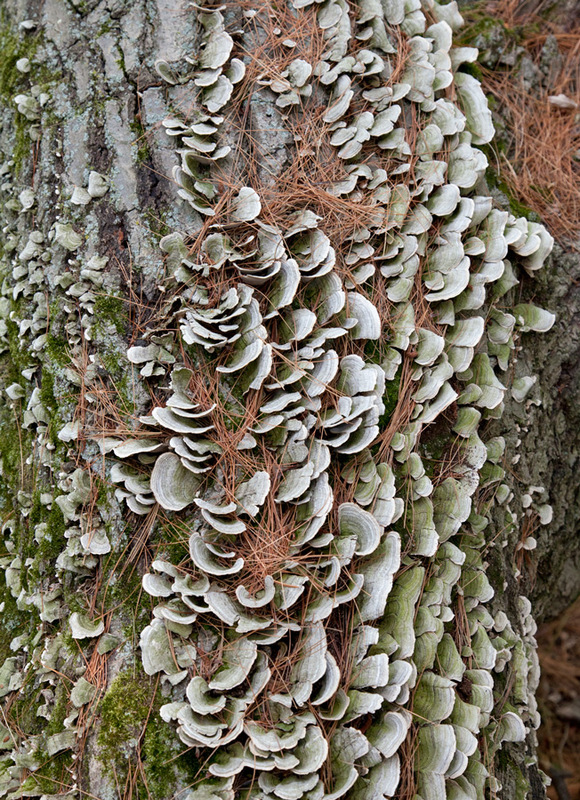 The increase in volume has been gradual as I walk a ridgeline, following the self-guided trail through the pines. But as I near the last marker on the trail, without any obvious crescendo, I am suddenly aware of the loud, persistent hum of rubber on concrete. Startled in equal measure by its familiarity and incongruity, I am struck with the uncomfortable realization that I might well be back in Milwaukee, walking as I so often do along the Menomonee River Parkway trying to ignore the same noisome intrusion. This very freeway, of course, brought me here for my own personal ration of the same natural amenities. “The automobile has spread this once mild and local predicament to the outermost limits of good roads—it has made scarce in the hinterlands something once abundant on the back forty.” Ironically, I have made my pilgrimage only to find the truth that I’ve known well all along: what I sought is indeed available to me in the “back forty” of my beloved urban wilderness areas of Milwaukee. After nearly three hours, feeling fully steeped in Leopold’s oeuvre, I’ve “come home” in more ways than I’d imagined possible when I set out this morning. 1Silica Sand Mining in Wisconsin, Wisconsin Department of Natural Resources, January 2012.